Recorded at the Salle Pleyel in Paris on November 25, 1960 — directed by Jean-Christophe Averty. Roy Eldridge, trumpet; Benny Carter, alto saxophone; Don Byas, Coleman Hawkins, tenor saxophone; Lalo Schifrin, piano; Sam Jones, string bass; Jo Jones, drums. Brought to you through the kind diligence of the indefatigable Franz Hoffmann. Yes, giants did walk the earth. Tell it to the children. Just yesterday, I stumbled into a delight (thanks to Franz Hoffmann and Tom Saunders) — a YouTube video offering musical selections from a 1935 Oscar Micheaux film: music by Clarence Williams, Willie “the Lion” Smith, Hank Duncan, Cecil Scott, Jimmy McLin, and Eunice Wilson. Here is that posting, with a link to the film. That is a kind of delicious time-warp experience in itself. Soon after, my friend, the most eminent / diligent jazz film scholar I know, Mark Cantor, asked me if I’d like to know more — and I not only said YES! but asked if he would mind if I shared his work with you. Generously, he agreed. And here it is. In Names & Numbers #61, within the general text of the Clarence Williams “Personnelography” (part 4), a pair of Oscar Micheaux feature films are cited as containing appearances by Clarence Williams. In point of fact, however, Williams is present in only one of these films, Lem Hawkins’ Confession (also known as Murder In Harlem). In light of the work that has been done with Williams’s recordings, personnels and solos, it makes sense to share what details are available regarding his sole film appearance. The second film noted in the article, Oscar Micheaux’s Swing, features the orchestra of Leon “Bossman” Gross, with Dolly Armina Jones added as a featured trumpet soloist. This film is a topic worthy of a detailed discussion in itself, although it should be noted here that Clarence Williams does not appears in the film: alto sax Leon Gross is the leader of the band, and the pianist is Arthur Briggs. To eliminate any further misunderstandings, it must be noted that the music track by Clarence Williams used in the SOUNDIE “Sweet Kisses,” which features dance performances by The Mitchell Brothers, Evelyn Keyes and other, with no band on screen, is not a unique recording for the producer, W.F.C. Productions, but rather one of Williams’s Lang-Worth broadcast transcriptions. Oscar Micheaux (1884-1951) is often cited as the greatest of early African-American filmmakers. While this is certainly open to discussion — the films of Spencer Williams are often more coherent, and those of William Alexander better made in terms of production values — one cannot argue with the talent and tenacity that Micheaux displayed in getting some forty-plus features produced and distributed between 1921 and 1949. Micheaux saw musical entertainment as an important factor in his films, both because audiences had come to expect cabaret scenes in black cast features, but also because musical performances could extend the length of a feature with relatively little additional cost, or risk of mistakes by less experienced actors and actresses. Lem Hawkins’ Confession contains an extended fifteen minute cabaret sequence in which a great deal of music and dance is seen and heard as the plot continues to develop. The music of Clarence Williams’ band aside, which is discussed in detail below, Lem Hawkins’ Confession is one of Micheaux’s most ambitious projects. Based on his original novel, The Forged Note (1915), the story was first filmed by Micheaux in 1921 as The Gunsaulus Mystery. On-screen credits also note the story The Stanfield Murder Case as an addition source of the film’s plot. Both the novel, story and film were based, in turn, on the notorious Leo Frank case, in which a Jewish factory superintendent in Atlanta, Georgia, was convicted of the murder of 13 year old factory worker Mary Phagan. Leo Frank’s sentence was commuted to life in prison due to what the governor saw as a miscarriage of justice. In August 1915 Frank was kidnapped from prison and lynched by a mob of prominent Atlanta civic leaders. Later evidence suggests that the factory janitor, Jim Conley, actually committed the murder, although that has never been proved. What is known is that a mob, including a former governor of the state, two mayors (one of whom was still in office), three law enforcement officers and a number of other prominent citizens lynched Leo Frank on August 5, 1915. While this became the foundation of the story filmed in 1935 as Lem Hawkins’ Confession, Micheaux altered the story considerably, to the point of eliminating the lynching, in his screen adaptation. As is sometimes the case with Micheaux films, the narrative is somewhat convoluted and often unclear, made even muddier by the constant use of flashbacks. It is important to note that the film is not a strict retelling of the Leo Frank case — the historical case is used as a very loose “frame” — and that Micheaux added a number of secondary plots; as noted above, Micheaux did not end the film with a lynching. A full and fairly accurate synopsis of the film can be found at the American Film Institute web site (http://www.afi.com). Here we are primarily concerned with the nightclub sequence in which all of the music is performed. The details of the musical content of the film follows a brief description of the film’s production. According to on-screen credits, Lem Hawkins’ Confession (along with the three Micheaux features that preceded it) were produced for Oscar Micheaux Pictures by A. Burton Russell. However, this is a nom-de-production of sorts for Alice B. Russell, Micheaux’s second wife. The Russell family would probably not have been able to invest in a project such as this one, and we are still two years away from the time that Sack Enterprises would be become involved in the financing of Micheaux’s films. Where Micheaux got the funding for this film, probably in the neighborhood of $15,000, is unknown. Relatively little is known about the actual production of the film, although further information about the plot, casting of actors and so forth can be found in Patrick McGilligan’s Oscar Micheaux – The Great and Only (Harper Perennial, 2008). The only known advertisement in the press (New York Amsterdam News, May 11, 1935) notes that the “Premiere New York showing” of the feature would be held that week at the Apollo Theater. While it is somewhat unusual to find copyright registrations for black cast films, this feature was indeed registered for copyright with the Library of Congress, along with a handful of other film produced by Oscar Micheaux on August 23, 1935. This informationallows us to estimate a production date as between fall 1934 (so claimed by McGilligan) and spring 1935. Lem Hawkins’ Confession was released in the late summer or early fall of 1935. 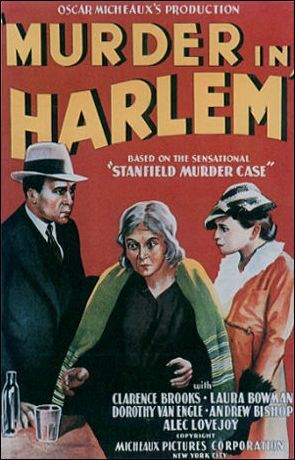 At some point in time the film was reissued as Murder In Harlem, with the new titled used for release in the South. Other sources suggest that the film was re-released yet again as Brand of Cain, although this has not been verified, and Brand of Cain may actually be an early pre-production title. While a production location has not been established, Micheaux would have probably worked at a rental stage in Fort Lee, New Jersey, although other facilities were also available in Manhattan. My suspicion is that it would have taken no more than a week, or perhaps 10 days, to shoot the entire film. Micheaux produced, directed and wrote the feature. He also gathered a group of technicians who were quite likely inexperienced in film production, but nevertheless able to help Micheaux turn out a fascinating dramatic piece. With the exception of recording engineers Harry Belock and Charles Nason, none of the men involved in the production appear to have made a film before this feature, and none turns up in the credits of any subsequent film. While none of his cast members appeared regularly in major Hollywood productions, many of were cast fairly often in black cast films of the period. Among the more familiar names are Clarence Brooks, Alec Lovejoy, Laura Bowman, Bee Freeman, Eunice Wilson and “”Slick” Chester. Although he is not credited on-screen, the band featured in the extended cabaret sequence is led by Clarence Williams. As musical director of the band, and presumably the entire floor show, Williams leads the combo, but does not play piano. Indeed, two well-known Harlem stride pianists sit side-by-side at the piano: to the front, almost certainly sits Hank Duncan, and to the rear, Willie “The Lion” Smith. (Smith’s trademark cigar can be seen in freeze frames of the duo.) Regrettably, there is no band feature per se, and neither Duncan nor Smith can be seen or clearly heard as soloists. The band includes two reeds, a musician who doubles on clarinet and tenor sax, and an alto sax. The first musician, seated to the left, is Cecil Scott. Not only has Howard Rye identified Scott aurally (Storyville Magazine no. 132, page 209), but Scott can be visually identified as well: compare the image of the musician here with Cecil Scott as he appears a decade later in four SOUNDIES produced for Filmcraft Productions. The alto sax who sits to Scott’s right is less easy to identify, but to my eyes it appears that this is Louis Jordan. While Jordan was a member of Chick Webb’s orchestra at this time, he had freelanced with Williams the previous year, and he recorded at least four titles with Williams in March 34; one of the numbers from this session, Williams’ “I Can’t Dance (I’ve Got Ants In My Pants) was repeated in this film. Mr. Rye is very astute in hearing a trumpet on soundtrack, especially because the musician can be seen only briefly on screen. While it seems logical that this might be Ed Allen, from what little can be seen of the musician on screen, it does not look like Allen to me. Howard also hears a string bass on soundtrack, but I can neither hear the bass, nor locate a bass player on screen. The band is rounded out by a guitarist, who I am certain is Jimmy McLin. Two other performers appear with the band, an unidentified male tap dancer, and vocalist Eunice Wilson. Wilson was a popular singer and dancer who presumably appeared as a club and stage performer in the Chicago and New York City areas. Three notices in Franz Hoffman’s Jazz Advertised cite performances around the time of the film’s production. The Chicago Defender (November 12, 1932) notes that Wilson will appear at a Thanksgiving Party at the Regal Theater, along with Earl Hines and his Orchestra. In June 1934 it is reported that she will be one of many on stage in a National Auditions Benefit Show, also at the Regal Theater, this time backed by Cab Calloway and his Orchestra. ` In late 1934 Wilson appeared in a Warner Brothers / Vitaphone one reel short, All Colored Vaudeville Show, filmed in Brooklyn and released the following year. In this short subject Wilson appears with a small rhythm quintet billed as The Five Racketeers, personnel unknown. Her vocal feature is a song by Leonard Reed titled “I Don’t Know Why,” which is followed by a dance to “Tiger Rag.” Subsequent to the production of the Micheaux feature Ms. Wilson sailed to London (May 1936) as a member of the Lew Leslie Blackbirds troupe. More than a decade passes before we hear from Eunice Wilson again, this time in two final film appearances. No Time For Romance (Norwanda Pictures, 1948) stars Wilson, and also features a jazz combo led by Austin McCoy; it is the first black cast film to have been produced in color. Sun Tan Ranch was made the same year, with a similar cast, and is probably also a Norwanda Production. Detailing the music in the cabaret sequence is difficult for a number of reasons. Save for the vocal and dance features, the music is played in the background, largely behind dialog, sometimes in complete performance, sometimes as a partial take. In addition, Micheaux’s rather rough editing, plus jump cuts resulting from damage to the master print over the years, makes it somewhat unclear where some numbers begin and end. Further uncertainty revolves around the actual recording of the soundtrack. While some black cast musical performances from the period are clearly filmed and recorded simultaneously, I suspect that the soundtrack for this film was prerecorded, with the musicians miming to the playback. While it seems that certain short segments, and even longer performances, might be repeated behind the dialog, I think that it is equally likely that the soundtrack numbers were recorded in a number of takes that could be “recycled” during the sequence. Lem Hawkins’ Confession An A. Burton Russell Production Micheaux Pictures Corporation Oscar Micheaux, producer, director and writer produced ca. late fall 1934 – spring 1935 Clarence Williams, musical director Clarence Williams and his Band: Clarence Williams, vocal and leader; unidentified trumpet; Cecil Scott, clarinet and tenor sax; possibly Louis Jordan, alto sax; probably Hank Duncan, piano; Willie “The Lion” Smith, piano; Jimmy McLin, guitar Much of the music is heard behind dialog, or in support of vocal or dance performance. Regrettably, there is no feature for the band in the cabaret sequence. (1) Ants In My Pants (Clarence Williams) – Clarence Williams and his Band (Clarence Williams and members of the band, vocal) (2) Ants In My Pants (reprise) (largely behind dialog) – Clarence Williams and his Band (3) unidentified title, based on chord changes to “Ain’t Misbehavin’” with an altered release – unidentified male tap dancer, accompanied by Clarence Williams and his Band (4) Ants In My Pants (reprise) (largely behind dialog) – Clarence Williams and his Band (5) unidentified title, partially based on the chord changes to “Nobody’s Sweetheart Now” (largely behind dialog) – Clarence Williams and his Band (6) Ants In My Pants (reprise) (largely behind dialog) – Clarence Williams and his Band (7) Harlem Rhythm Dance (Clarence Williams) – Eunice Wilson, vocal and dance, accompanied by Clarence Williams and his Band (8) unidentified title, or perhaps two titles linked closely together, the second of which is definitely a repeat of # 5 above (largely behind dialog) – Clarence Williams and his Band. Posted in "Thanks A Million", Bliss!, Generosities, It's A Mystery, It's All True, Jazz Titans, Jazz Worth Reading, Pay Attention!, Swing You Cats!, That Was Fun!, The Heroes Among Us, The Real Thing, The Things We Love, Wow! I believe that is Clarence himself singing I CAN’T DANCE (I GOT ANTS IN MY PANTS); the tap dancer works out to a themeless DOIN’ THE NEW LOW DOWN; the band returns to I CAN’T DANCE behind the odd “bogeyman” scene; Eunice Wilson shows off her talents to HARLEM RHYTHM DANCE. Cecil’s sound is absolutely unmistakable — and the Lion AND Hank Duncan on film in their prime? Astonishing. Who would have thought that a film with some connection to the 1913 Leo Frank case would have had such delightfully jubilant music? I know that we have a million reasons to thank George Wein — going all the way back to Forties Boston and up to this very moment — but I propose that this band and his continued stewardship of NJF All-Star bands is something that hasn’t been sufficiently applauded. At a time when most of these musicians would have been under-employed or under-paid, George had the foresight to get them gigs all around the world, to encourage them to play a loose personal version of the Mainstream jazz they created so beautifully (having an awfully good time at the piano, too). Here we have a very vivid reminder of a beautiful band, fueled in equal parts by fun and generosity. Posted in Bliss!, Generosities, Hotter Than That, Irreplaceable, Jazz Titans, Mmmmmmmmmmmmm!, Pay Attention!, Swing You Cats!, That Was Fun!, The Heroes Among Us, The Real Thing, The Things We Love, Wow! Thanks to the tireless Franz Hoffmann, here is a Bing / Louis sighting I had never seen before — a staged “impromptu” romp on a train from HERE COMES THE GROOM, a 1950 film. The “song” is in praise of Christopher Columbus, who in those Cold War times, is heralded as the man who made the unique freedoms of the USA possible. Rather unsubtly. The Commies were watching these musicals and trembling, perhaps, at the “opening of freedom’s door”? I prefer Fats Waller’s version of the “discovery” of “America,” myself. It seems that Bing enlisted all his friends for this Paramount film and this number: Dorothy Lamour, Louis, Phil Harris, Cass Daley, Frank Fontaine. Austin J. Casey, connoisseur of such things, points out that the man to Bing’s left (twenty seconds) sang tenor with the Modernaires. In some ways, it is a development of the bus-mania of the Thirties, where Clark Gable could get everyone to sing THE MAN ON THE FLYING TRAPEZE in the 1934 IT HAPPENED ONE NIGHT. I find it a fascinating example of how cruel old-fashioned humor was and how (I hope) it seems painful now: Cass Daley’s crossed eyes are nothing to “Crazy Guggenheim,” Fontaine’s intellectually-challenged character — a staple of Jackie Gleason’s television shows — his “Crazy Guggenheim” a mask for his lovely singing voice. But this was the era of the “moron” joke, so “Crazy” gets the last . . . word? But any opportunity, no matter how vapid the material, to see Bing and Louis in each other’s company, uplifts. Posted in "Thanks A Million", Awful Sad, It's A Mystery, Jazz Titans, Pay Attention!, Swing You Cats!